A ubiquitous talking-point in Turkish foreign policy is the claim that, under AKP rule, the country’s GDP has tripled. This, however, is a misleading number as it relies on valuing US dollars of Turkey’s GDP at current prices, thus pooling both inflation of the dollar and the real appreciation of the Turkish lira on top of real growth. In real terms, Turkish GDP at constant prices grew by 64 percent between 2002-2012, and GDP per capita grew by 43 percent. A decent growth rate, but nowhere near the miraculous. This number has nonetheless made its mark, and hilariously seeped into one of The Economist’s articles on Turkey’s economy, resulting in a correction that will make nerdy economists giggle for centuries. 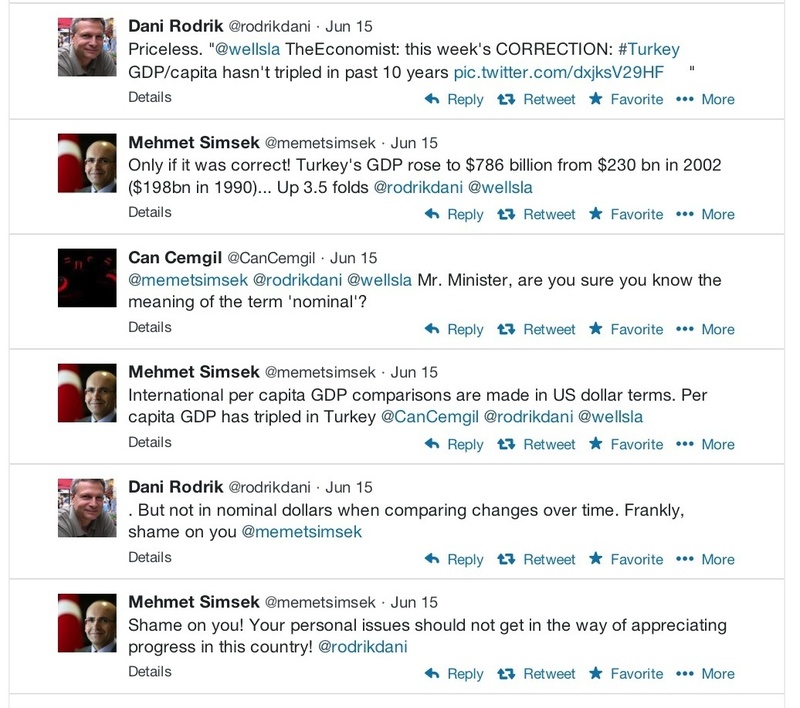 A discussion of this hilarity took a surreal turn when Turkey’s finance minister, Mehmet Simsek, weighed in and, in front of one of the leading international economists in this world, saw his credentials as an economist… well, somewhat perturbed. The incident was not without comical appeal, the least since Turkey still has inflation rates in the order of 7-8 percent, and only ten years ago experienced rates above 20 percent. (For more, see Emre Deliveli and Dani Rodrik’s posts on this event). Somewhat less fun has been to see how this widespread misleading figure of a country’s economic performance has taken root in the Swedish government’s (as well as other governments’) push to promote economic relations with Turkey. In my last post I noted a rather unfortunate op-ed in a Swedish daily, published in November last year by Sweden’s foreign minister just before Erdogan’s state visit to Sweden. In addition to the rather provocative title, “Erdogan’s Turkey is on the right path”, the article also adopted the misleading talking point in praise of recent growth in current prices. Turkey is one of the most dynamic growth markets today, and has succeeded in opening up its industrial sector, exposing it to competition and promoting diversification. The country has tripled its GDP per capita in ten years and has acquired a growing middle class. The main challenges now lie in attracting more investment and raising the educational level. Ok, so growth? check! Middle class? Check! Liberal economic policies? Check! Well, not so fast. If Turkey is such a dynamic growth market for Sweden, then we should have observed an unprecedented expansion of exports to Turkey of high-value goods that middle classy people like to consume. Unfortunately, neither of these are necessarily true. First of all, as the below graph shows, Swedish exports to Turkey were if anything higher before its financial crisis in 2001. 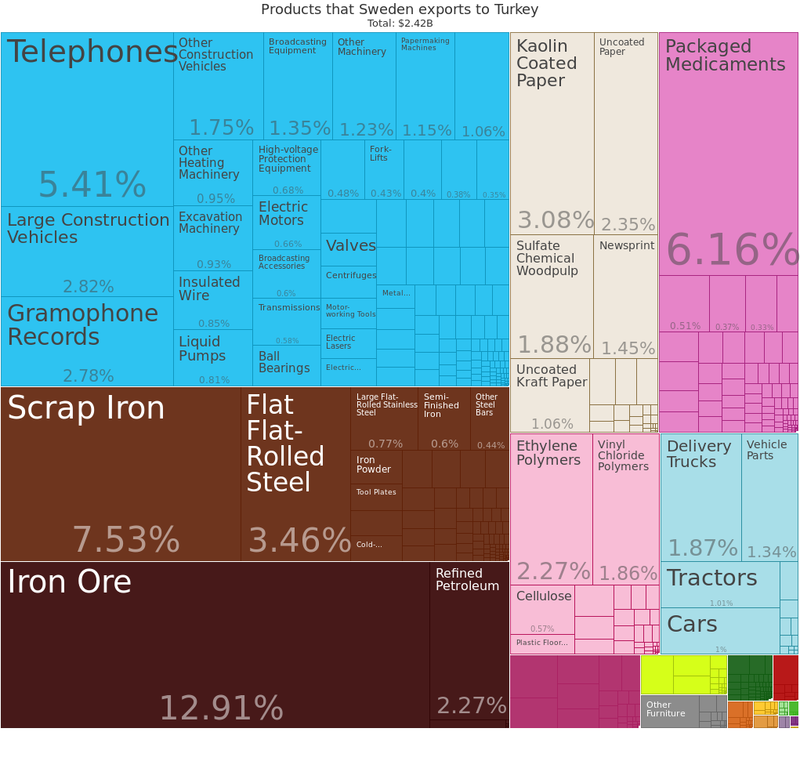 The years after this severe crisis, exports to Turkey were understandably unusually low. Secondly, the growth in exports to Turkey have been stagnating in the last couple of years. (I’m going to let it slide that the Swedish Consulate in Istanbul chose to publish on their website only the 2011 growth value). Whereas Turkey has claimed back its previous position as a significant trade partner to Sweden, increases in Swedish foreign direct investments (FDI) in Turkey have remained much more muted. Despite several cases where Swedish firms have bought assets in Turkey, in 2013, Turkey still only ranked 40th largest recipient of Swedish FDI, behind many other emerging economies (again, according to SCB). So why have we not seen more Swedish investment in Turkey if it is such a booming economy? U.S. exporters face many of the same challenges that exist in other semi-developed countries, such as contradictory policies, regulations and documentation requirements, lack of transparency in tenders and other procurement decisions, and a time consuming, unpredictable judiciary and legal and regulatory framework. Careful planning and patience are the keys to success in Turkey. “The country is quite centrally controlled and Swedish companies often need official support to succeed. In this way, good diplomatic relations with Turkey can make a difference and make life easier for the business sector. The idea that good diplomatic relations will substitute for good institutions for investment is a rather strong assumption. Especially since recent Turkish history is full of cases of state intervention in private firms. In recent years, investors have gotten much experience in this. 2. During the Gezi protests last year, a hotel owned by the Turkish conglomerate Koç Holding allowed protesters shelter from a brutal police crackdown. About a month later, the government began tax audits into three Koç-owned companies. The conglomerate, one of the largest in Turkey, reportedly lost $1bn in stock market losses in one day (see here). 3. Earlier this year, several government-owned (or related) companies, appeared to coordinate ceasing all business relations with Bank Asya, a bank affiliated with the powerful Gulen movement. An article by Bloomberg noted these attacks on Bank Asya as a casualty in the political conflict with the Erdogan government and the Gulen movement. Between mid-Dec and early February, the company’s stock lost nearly half of its value. 4. All of these incidents have involved Turkish companies, but there have also been incidents involving Swedish companies. A case in point is the travails of Telia Sonera and its attempt to buy Turkey’s largest telecoms operator, Turkcell (see the many well-written articles by FT journalist Daniel Dombey). In 2005, a deal was reached with Cukurova Holding to purchase a majority-stake in Turkcell, but as the deal went sour, it turned into a legal battle involving TeliaSonera, Cukurova, and another Russian-owned holding company. The case dragged on for years through arbitration courts. Last year, the Turkish government ran out of patience and legislated a takeover of Turkcell’s board of directors. Using a new law that allows the government to take over boards that fail to appoint directors in line with other Turkish legislation, Turkcell thus ended up with a board made up of former AKP members. In August, two additional directors were appointed – both Swedes. A delicate situation has thus evolved, where Telia Sonera’s huge investment in Turkcell is subject o the whims of Turkey’s government, and in the future it will likely have to rely on the Swedish government’s relations with Erdogan. Further complicating the matter is that Turkcell has played a crucial role in the state security push to detain and prosecute numerous human rights and union activists, as reported by Swedish newspaper Arbetet (among several). At a meeting of the European Venture Capitalist Association in Istanbul today, Turkey’s Finance Minister Mehmet Simsek got a zinger of a question: “Is it time to call the doctor?” asked Jochen Wermuth, chief investment officer at Wermuth Asset Management. Wermuth was referring to the notion being promoted by Prime Minister Recep Tayyip Erdogan and his government that bizarre international conspiracy provoked recent protests in Turkey. He cited one particularly odd claim, from a pro-government Turkish commentator, who said the German airline Lufthansa was in on the plot because it wanted to prevent construction of a huge third airport for Istanbul and so avoid competition for its hub in Frankfurt. Many of these firms used to have good relations with the Turkish government. Their experience is a warning sign that good relations today do not necessarily imply good relations tomorrow. And when that happens… well, let’s hope it doesn’t. 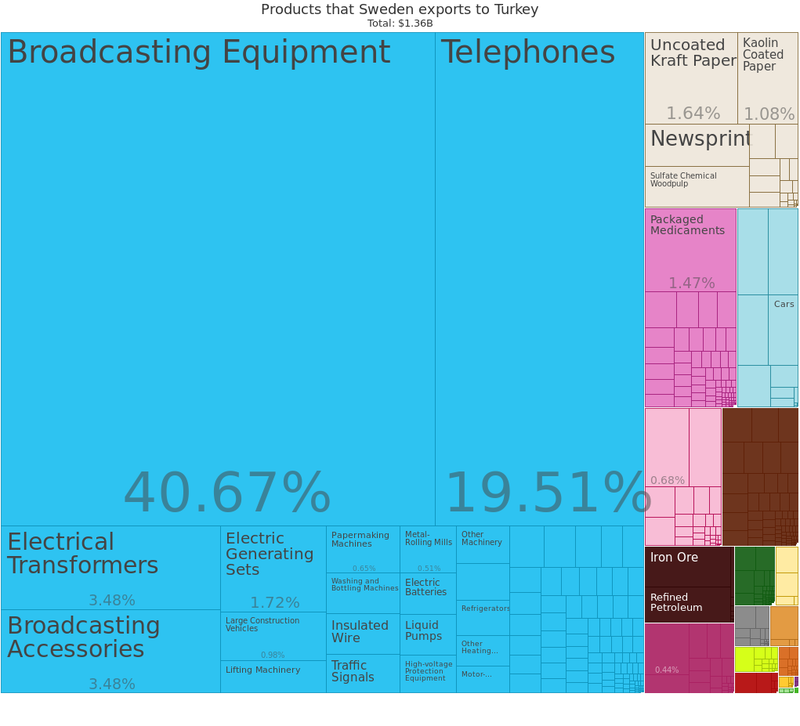 There are several reasons why Swedish firms should be interested in doing business in Turkey. There are at least as many reasons why such activities should receive well-informed, prudent advice from government agencies, and not just in backdoor meetings but on publicly available websites. Turkey’s flawed institutions hampers its capacity to become the economic powerhouse that the government claims it has become, which it hasn’t yet, but nonetheless still could. 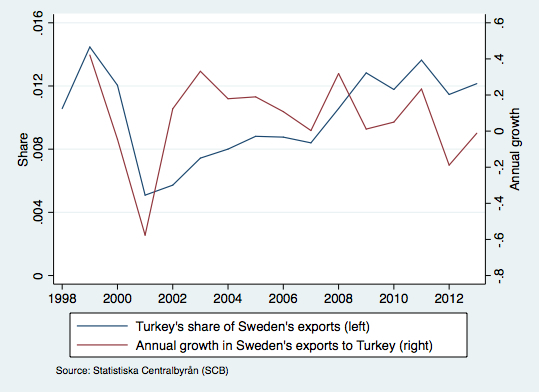 This also limits gains of trade between Swedish and Turkish firms. The Swedish government can be a better friend to Turkey and its people by putting an end to repeating the Turkish governments talking points and shifting to an institutional focus on Turkey and its need for democratic reform. A Turkey with more open and democratic institutions will benefit firms and people alike, and not just those with the good connections to the government.